MY CHOCO ng AIM Global! Punong puno ng vitamins and minerals, prutas at gulay na chocolate drinks . Kaya hindi ka mahihirapang ipainom sa anak mo. For children 2 years old and above. Isa lang yan sa mga best-selling products ng AIM Global. gulay at prutas,painumin po sila ng MyChoc. Maganda rin po ito sa pampagana ng pag kain..
• Is the only chocolate served today that preserves the true richness of chocolate with the addition of great health benefits. • Is added to hot or cold water to give it a malted chocolate flavor and extra texture. 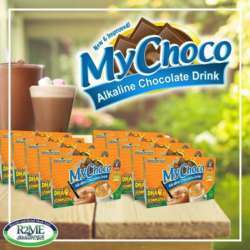 • Rich, smooth, refined, classy that’s how we describe My Choco- a delightful new chocolate functional beverage from Aim Global. • It is a chocolate healthy food drink made from premium cocoa blend, which is extremely tasty, and makes nourishment truly enjoyable and exciting! • Is fortified with DHA (Docosahexaenoic Acid), benefits for both kids and adults, essential to mental, visual and neurological acuties needed for memory, concentration and focus. 131 POWER ingredients in one sachet! It can enhance the concentration, focus and memory of your kids. It heightens alertness level, enhances mental functions and visual acuity. It also relieves headache, reduces fatigue, rejuvenates skin and others. Adult can also drink this for possible memory loss. 1 box has 20 sachets of choco drink. Enjoy it hot or cold! Send US A MESSAGE THROUGH +254704042712.